Moisture analyzers are measuring instruments specially designed for determination of moisture content in relatively small samples of various substances. ·drying profiles (standard, mild, step, rapid). ·finish mode (manual, humidity stabilization, automatic, time defined). Maximal capacity of moisture analyzer series MAX ranges from 50 g /1 mg to 210 g/1 mg. Moisture content is measured with accuracy 0,01% (0,001% for samples up to 1,5g). 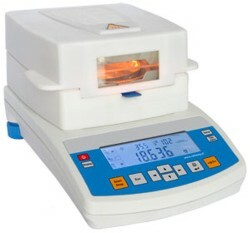 Maximal drying temperature equals 160°C (an extra cost option is moisture analyzer for drying with temperature 250°C). A moisture analyzer with a special set provides possibility of testing permeablitity of water vapour through samples of different substances.